How Has Public Investment Improved Lives and Well Being?How Has Public Investment Improved Lives and Well Being? How Has Public Investment Improved Lives and Well Being? With this being Memorial Day I thought I would take a slightly different spin to honor this holiday. I, of course, want to thank everyone who has served to help protect our country. The first people to honor and offer our most sincere form of gratitude is to those in the armed forces who literally putting their lives on the line to defend our country. They would not be able to be as successful as they have been, however, without the countless others who have contributed to the defense of this country and improving our welfare. There has been a great deal of discussion among the G-7 countries about how ineffective monetary policy has become and that countries must turn to fiscal support to help stimulate growth and bring down under-employment and unemployment. I fall into this camp and believe that significantly enhancing our investment in infrastructure and other critical social goods is a no brainer. Unfortunately, Congress is full of people with seemingly no brains so I am not optimistic this will happen. We are not constrained financially from doing it, only politically. There is such toxic ideology around the role of government and what it should be spending money on and what it should not. People on the far left think the government should be involved in everything while those on the far right believe it should be involved in very little and leave it up to the private sector. Of course, there is a happy medium. One thing that is hard to argue, however, is our society and the world has become much better off in terms of improving standards of living and productivity by many of the investments in research and development carried out by the government via the Department of Defense and NASA. I wanted to espouse some of the benefits of government spending via some of the technology that has been commercialized from investments made from defense spending and from NASA. As the list above shows, The ACOE was involved with providing construction support for NASA. Each year NASA publishes Spinoff which highlights some of the most successful accomplishments in terms of the commercialization of NASA technology. It is a fascinating read. While most of us are not putting our lives on the line to defend our country, a very large number of us pay taxes to help support the military and the countless numbers of very bright and hardworking people who are doing extraordinary work in terms of developing technologies that can greatly improve the odds of our military succeeding in its various missions. Fortunately, some of these technologies have spillover benefits to the private sector that can benefit an even wider swath of humanity as Spinoff shows. A water filtration system providing safe, affordable drinking water throughout the world. This is the result of work done by Marshall Space Flight Center engineers. This was created to sustain astronauts living on the International Space Station. Remote-controlled tractors with a margin of error of one centimeter are the result of work done at the Jet Propulsion Laboratory (JPL) by scientists working to design ultra-precise GPS for use on a satellite probe sent into orbit to test two unverified predictions of Einstein’s theory of relativity. This has resulted in greater crop yield, reduced chemical use, and less wasted water. A bacterial spore detection system developed at JPL for cleaning Mars-bound spacecraft is now employed by a private company as an anthrax detection system. Langley research engineers developed a low-cost device that creates electrical energy out of mechanical energy. It is now in widespread use as a wireless light switch and contributed to renovation and reconstruction efforts in areas affected by Hurricane Katrina. 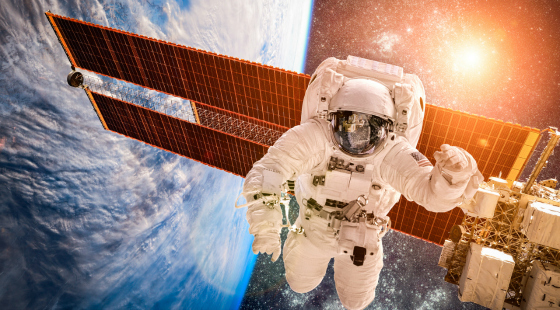 Advances in space suit design have resulted in widespread applications such as therapeutic cooling and heating suits; safe, efficient pharmaceutical manufacturing; new, simple-to-use, life-saving gas and chemical masks; and lighter-than-air vehicles. An environmentally friendly remediation solution to restore grounds contaminated by chemical compounds used during rocket launches in the early days of the space program is now cleaning up areas around the United States. Tiny LED chips used to grow plants on the space shuttle and International Space Station are being used for wound healing and chronic pain alleviation. A NASA researcher developed a technology which is now being implemented as an adjustable patient harness system to treat patients recovering from traumatic brain injury, stroke, spinal cord injury, and hip or knee replacement, as well as aid military personnel with spinal cord or traumatic brain injuries at Walter Reed Army Medical Center. The device provides patients with the opportunity to stand and walk in a safe and controlled environment without constant assistance from a therapist. A robotic vision system designed to determine the position and orientation of bar code targets without the use of lasers led to the development of sophisticated crash test dummies and computer test models that provide repeatable, computerized evaluations of laceration injuries. These dummies and models are now being used by automobile and component manufacturers in vehicle testing worldwide. After a hailstorm damaged the foam insulation covering the external tank on the space shuttle, Kennedy Space Center developed a system to determine the exact scale of the damage incurred. This device is now being used by law enforcement to shoot scaled photos of blood patterns, graffiti, and other criminal evidence. A mineral identification tool developed for NASA’s Mars Rover Technology Development program is now being used by law enforcement and the military to identify suspicious liquid and solid substances. It can measure unknown substances through glass and plastic packaging materials. NASA testing of metallic materials in an undercooled state has contributed to the development of a new type of metal that is twice as strong as titanium but behaves more like a plastic with its flexible, moldable properties. It is now found in baseball bats and hockey sticks, jewelry and wristwatches, cell phones, orthopedic implants, and coatings for industry. A collaboration with other government agencies and private industry resulted in an advancement in aviation safety that provides pilots with a synthetic vision system. This system provides a real-time, forward-looking depiction of terrain in 3-D, directly on the primary flight display, regardless of the time of day or weather conditions. NASA’s remote-sensing satellite information has been used to provide innovative geospatial solutions for a variety of applications, including a crop prescription service for farmers; a disaster management networking tool for government agencies; and an educational service for young farmers. A technology developed by JPL to explore the possibility of life-giving elements on Mars is now employed on aircraft as a means to measure water vapor and thus deliver real-time weather forecasting to help pilots avoid dangerous weather conditions. A remote command and control system developed by NASA engineers to run experiments on the International Space Station is the core technology behind an intelligent oven that consumers can program to start cooking dinner before they get home, via a cell phone or internet connection. A low cost, lightweight parachute is being used to lower small airplanes safely to the ground in emergency situations. A Mars Exploration Rover prototype robot and an autonomous stair climbing robot created at JPL have been further developed into commercial tactical reconnaissance robots that are being used in Afghanistan and Iraq to help U.S. troops clear caves and bunkers, search buildings, cross minefields, and deal with improvised explosive devices. A partnership between the Johnson Space Center and private industry has developed technology for autonomous rendezvous and docking of space vehicles to service satellites has resulted in a new eye-tracking device for LASIK surgery. Supercomputer experts from Ames Research Center and engineers from Johnson Space Center teamed up with famed cardiologist Dr. Michael DeBakey to develop a ventricular assist device that functions as a “bridge to heart transplant” by pumping blood throughout the body to keep critically ill patients alive until a donor’s heart is available. That is quite an impressive list and barely scratches the surface of how public investment has greatly improved the lives and well being of not only Americans but millions of people around the world. The interstate highway system, dams, bridges, communications, improving life expectancy, education, and basic scientific research are just a few of the major areas we have earned huge rewards from a partnership between the federal government and its various agencies and the private sector. With the world mired in sub-par economic growth and millions of people underemployed or out of work, I must agree with the finance ministers of the G-7 that sensible and prudent fiscal policy expansion is the lowest hanging fruit to catalyze greater growth and improved living standards. There are absolutely zero economic constraints for a more robust fiscal expansion in the United States. The only constraint is political and unfortunately, I have very little faith that there is enough courage and common sense to overcome this formidable obstacle. Thank you again to the millions of Americans who have made great sacrifices for the country, both on the battlefield and off. We are the land of the free because of the brave.